Actually- happy almost galentine's day!!!! Galentine's Day, according to Leslie Knope, is on February 13th. It's "the best day of the year" with "ladies celebrating ladies." I'm going through a couple work changes over the next couple weeks, and while I add Jesus first and don't value waffles as much as Leslie Knope does, two lessons come to mind: 1) start celebrating Galentine's Day, and 2) remember what's important in life- meaning life doesn't revolve around work. This recipe comes from Flour bakery out in Massachusetts and is my one of my favorites. 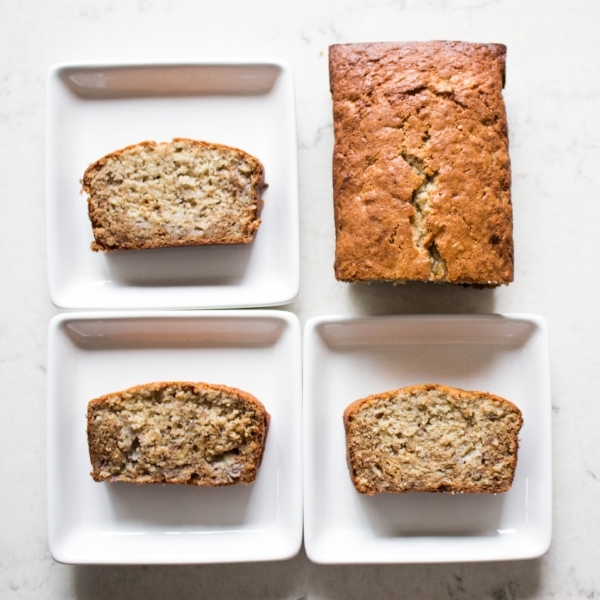 To be honest, i haven't made many banana bread recipes before. at this point, i don't know if I even want to because I love this recipe so much. it's made many tummies happy, brunches delightful, and has used up all the rotting bananas I've grabbed from work (truthfully because I either over-ordered for the office, or they all showed up green on a Monday and were spotty already by Friday). 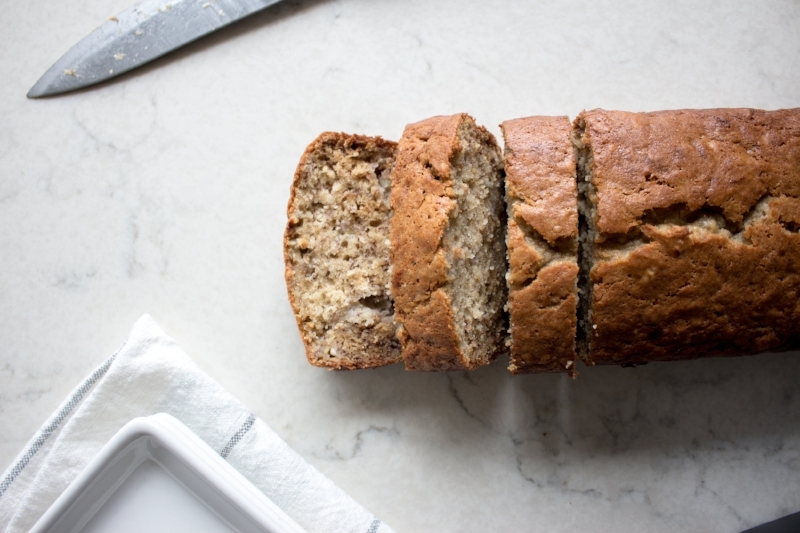 It's a moist and dense banana bread, made with simple ingredients you can find in your pantry. I've adjusted just a couple things to make it easier for lazy me, and you can find those notes in the recipe below. It keeps well and tastes even better the next day as the flavor deepens. Freeze a couple slices if you'd like, though I doubt it'll last that long on your counter, but do at least store it in the fridge if your kitchen gets particularly warm. baker's notes: I don't suggest any add-ins, as I like my banana bread plain and simple- but if you must, feel free to stir in 1/2 cup of chocolate chips, and a small handful more to sprinkle on top, or 2/3 chopped toasted walnuts. and a valentine's day gift idea: I made this banana bread last year for c, added chocolate chips, and wrote a sign that said "you drive me bananas, but i loaf you." clever, i know, but really, when you don't know what to give, the answer is banana bread (with chocolate chips maybe). PSSSSSSStttttt: click here for a fun banana bread video, and #shamelessplug- follow me on instagram if you haven't yet!! preheat oven to 350 f. grease and line a loaf pan with parchment paper. set aside. in a large bowl, beat together sugar and eggs until light and thick. (note: the recipe says for 10 minutes, but i'm lazy, so i do it for like 3). drizzle in the oil. mix in mashed bananas, greek yogurt, and vanilla. stir in the flour, baking soda, cinnamon, and salt. fold until no more flour streaks remain- don't overmix! pour the batter into the prepared loaf pan, and bake for about 45 minutes to an hour, until a toothpick inserted in the center of the loaf comes out clean. If the loaf isn't done at the 45-minute mark, lay a piece of foil over the loaf, and continue baking. remember, watch the loaf, not the time. enjoy, preferably with your galentine's brunches!